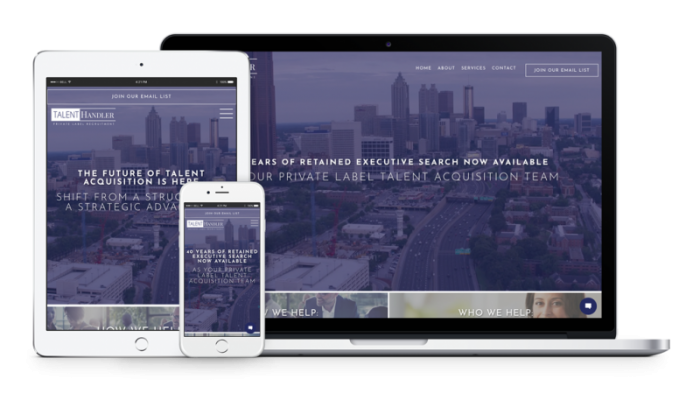 TALENTHandler is a private label recruitment service for companies that want to turn their talent acquisition function into a strategic advantage. With their large network business connections, TALENTHandler is able to consistently help companies fill to top-level executive positions with skilled and experienced hires. TALENTHandler’s parent company, Handler & Associates came to Barta Media Group in need of a website for their new brand so they could begin building its online presence. The end result was a great-looking, professional website that exemplifies the quality of their service and the talent they provide. It was important to TALENTHandler that they instantly be recognized as an Atlanta-based company. To do this, we made a full-screen banner with light purple overlay showing aerial footage of Atlanta the first thing visitor see when they land on the site. The new website also features case study video and an overview video to showcase what TALENTHandler is all about. Utilizing responsive design, TALENTHandler’s new site fits perfectly across any device. And with custom WordPress development, they can easily manage their site’s content.